A monument commemorates the Major Thomas Mitchell Expedition which passed through the area in 1836. 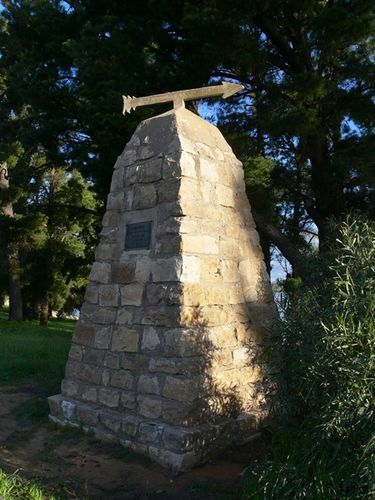 HORSHAM Tuesday - The unveiling of a cairn at Green Lake to mark the route taken by Major Mitchell when he explored the country in 1836 took place in the presence of about 600 school children. The function was one of several arranged by the Rotary Club in connection with Youth Week. The cairn was unveiled by the president of the Wimmera Shire (Councillor J M Crick). Addresses were delivered by Mr. Lamb M.L.A: Mr J F Menadue a member of the board of directors of the Australian Natives Association: Mr R F McNab representing the Historical Society of Victoria: and Mr H W Radford, president of the Rotary Club of Horsham. Argus (Melbourne), 28 April 1937.